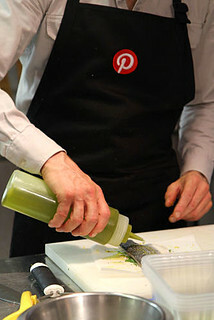 Last week I braved the torrential rain to attend a special Pinterest event, a cookery class with chef Tom Aikens (swoon!) 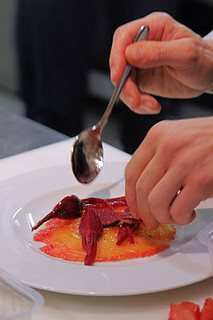 learning how to make 3 fabulous fish dishes! 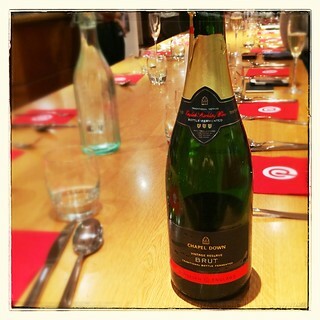 On arriving at L'atelier des Chefs cookery school, I was greeted by the event's host Lizzie from Pinterest, who was armed with Chapel Down Brut, which just so happens to be one of my favourite English sparkling wines. 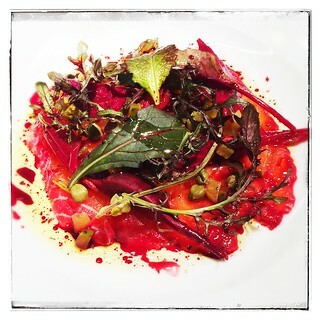 This went down a treat as I had a nosey around the well equipped, clean cookery school. 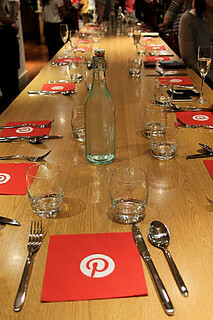 There were around twenty food writers and bloggers there, all eagerly looking forward to the evening. 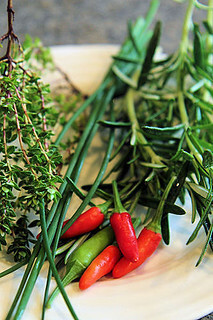 Some of us had bought herbs and tomatoes from our gardens for use in the dishes. 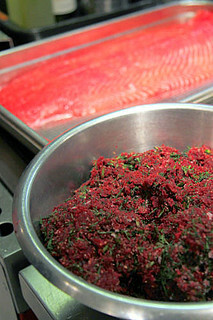 Our cook-a-long started with a dish of Beetroot Marinated Salmon, Beet Dressing and Picked Baby Beets. 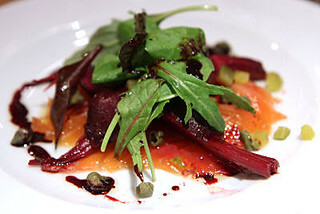 Yep, a lot of beetroot and it's not something I am a huge fan of, I know most people absolutely adore it though. Having said that, it gave the salmon a lovely flavour and fantastic colour, and it's one of those dishes that you can easily prepare ahead of time and serve to your guests as a starter. 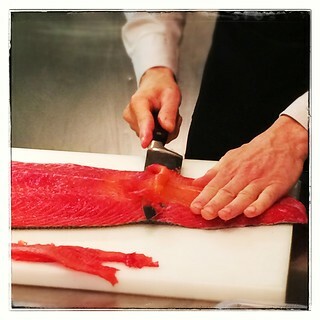 We practised slicing a large piece of salmon into wafer thin slices, and even though Tom was nervous that someone would slice off their own skin with the sharp knives, we proved we were a pretty capable bunch with our see-through salmon slices! 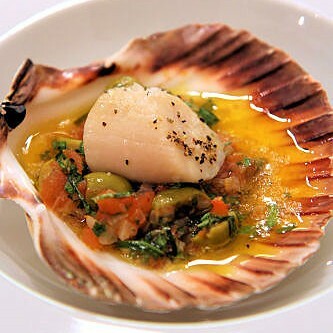 Our next dish was Baked Scallops with Sauce Vierge. 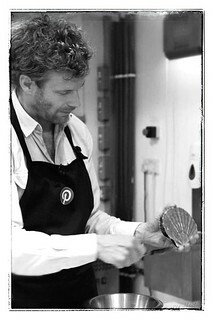 We were shown how to remove the scallops from the shell and prepare them. 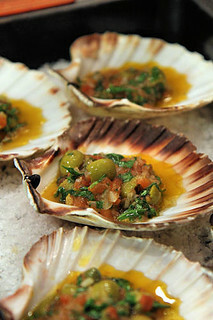 The sauce was made from fresh tomatoes, shallots, garlic, capers, olives, lemon juice and fresh herbs - it had a fabulous Mediterranean feel to it and once the sauce is prepared the dish only takes 5-8 minutes in the oven. 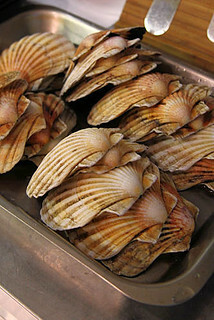 This was served with a chilled glass of Chablis, and we were encouraged by Tom to slurp the juices from the shell! 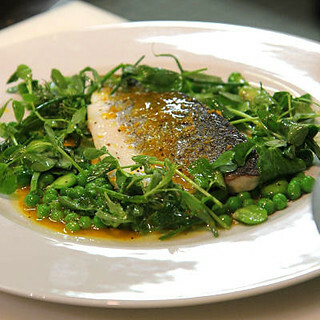 My favourite dish of the night was a light, fresh, Seabass with Herbs, Peashoots and Orange. 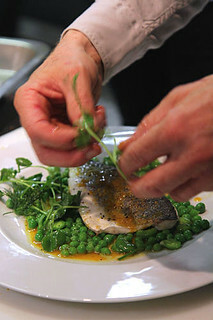 The fish is laid onto greaseproof paper with lemon, orange and herbs, then it's adorned with the most wonderful orange vinaigrette and a sprinkle of orange powder, before baking in the oven for only a few minutes. 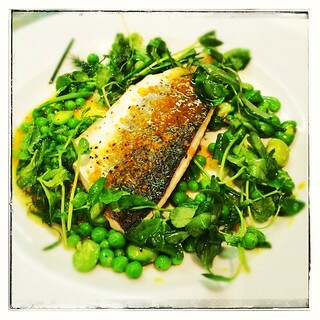 It was served with warm peas, broad beans and a sprinkle of peashoots. It was a most enjoyable evening and it's always great to turn up at a cookery class and find all the ingredients laid out before you and NO washing up either - love it! 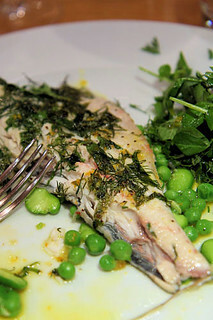 I'll definitely be giving the recipes a try at home, and have added seabass to my shopping list. If you haven't had a look at Pinterest yet, what are you waiting for? 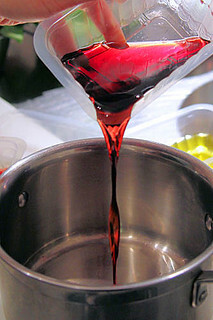 You can now search for recipes, ingredients and... anything else that takes your fancy! 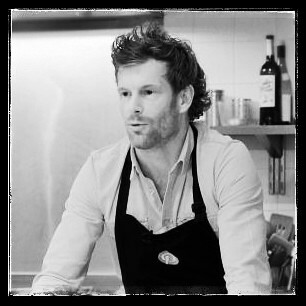 While you are there, have a look at Tom Aikens' boards and Pinterest's own Tom Aikens Home Grown Cook-a-Long board for pinspiration. I've also got plenty of interesting boards to keep you busy! Read about the evening from Pinterest's point of view here. Disclaimer: I attended the event as a guest of Pinterest. 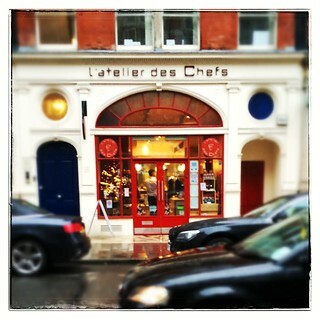 Many thanks to Pinterest, Tom Aikens and L'atelier des Chefs for an enjoyable evening.